“The safety and security of you and your loved ones in an uncertain and ever changing world is of paramount importance. 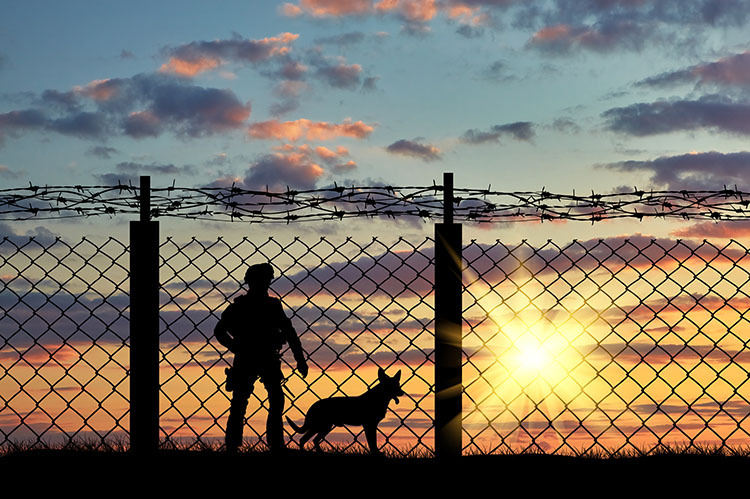 One of the most important investments and decisions you could make in order to ensure your continuing safety is your choice of a highly-trained and effective protection dog. It is therefore essential that you choose the right specialists to provide you with a dog that will faithfully guard you and your family. When making this choice you need to be confident in the people and the organisation with which you are dealing. Major (Retired) Gerry Hill MBE QGM + Bar spent just short of 45 years in the British Army, the last 34 of which were served in 22 Special Air Service Regiment. During this time he saw service in Northern Ireland, the Falkland Islands, the Balkans, across the Middle East and Afghanistan. While serving in the SAS, Gerry received four gallantry awards – two Queen’s Gallantry Medals (QGM) and two Mention in Dispatches (MID) as well as a Member of the British Empire medal (MBE) and a Commander in Chief Commendation (CINC) for valuable service. Major (Retired) Gerry Hill MBE now dedicates much of his time as CEO of HIRE A HERO, the military charity he set up which helps military service leavers with employment and mentoring after leaving the armed forces. K9 Serve & Protect Ltd are specialist providers in the training and supply of elite personal protection dogs to families, executives, high net worth individuals and corporate organisations. We are also suppliers in general purpose patrol dogs and specialist detection dogs. The company was conceived by a group of like minded professional individuals including highly trained dog handlers and instructors, professional dog handlers from within the police and military communities and those involved in risk consulting to corporate organisations and high net worth individuals. Our experienced team of dog handlers, instructors and operational staff are passionate about developing an elite protection dog program that sets the highest possible standards and benchmarks for the ultimate highly trained protection dog with the simple aim of being the best suppliers and providers of protection dogs in the UK. The company was established in response to the very poor standard of protection dog suppliers and training companies currently existing and operating in the UK marketplace. Many of these so called “protection dog” suppliers were set up as extensions of kennel operations purporting to specialise in the sale of “protection dogs” but in reality were selling untrained “guard dogs”. K9 Serve & Protect predominantly train and supply German Shepherd Dogs (GSD), Dutch Herders /Dutch Shepherds and Belgian Malanois, all of which are the preferred breeds of military and law enforcement agencies due to their skill set, obedience, intelligence, agility and social interaction with their family pack. It is for this reason we believe that these breeds represent the best all round dogs over any other breed for protection purposes, social integration and adaptability to family environments and to develop as trusted family pets.